Web application providing different stakeholders custom views. 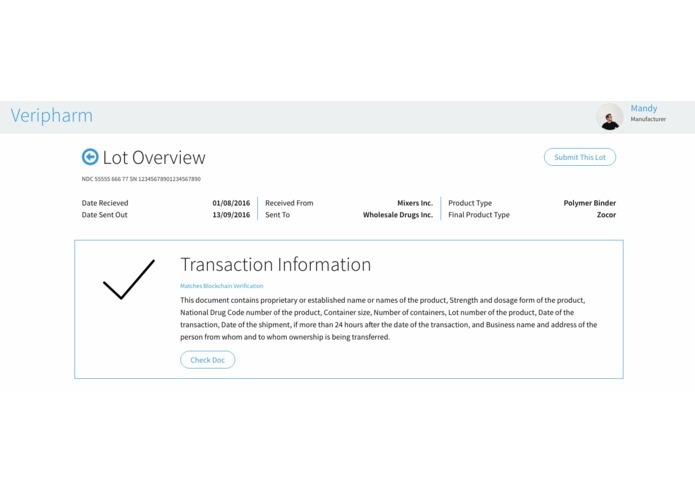 Incoming materials for the manufacturer showing validate by the blockchain. Documents validated through handoffs between stakeholders in the supply chain. 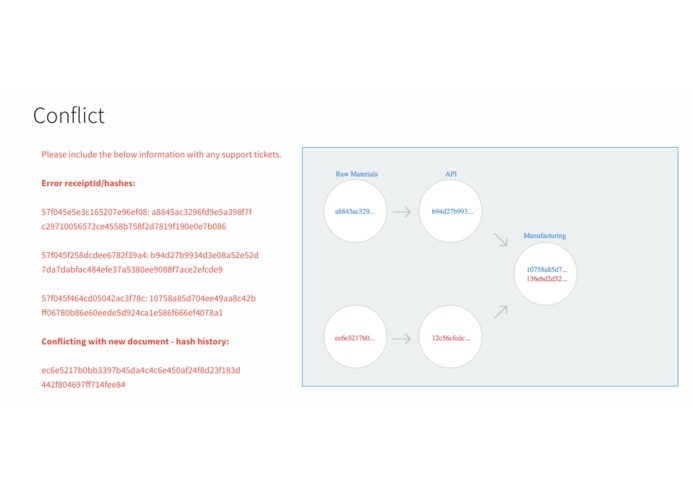 Conflict tracking to determine where the chain has been broken through auditing on the blockchain. From raw material to the hands of the patient, Veripharm ensures quality and accountability at every step of the drug supply chain. Pharmaceuticals travel through many steps in the supply chain management before they are consumed by the patient. During this chain, many problems could be encountered, such as counterfeiting and delayed recalls. 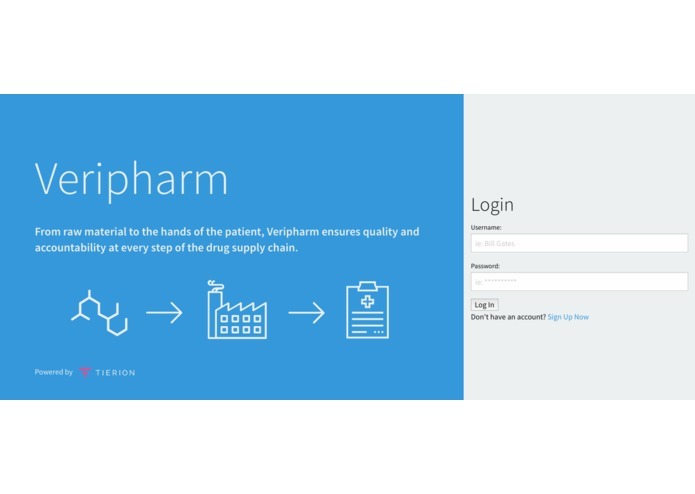 Veripharm allows all stakeholders in the supply chain to track their inputs and outputs and write the verification of their work to the Bitcoin blockchain through the Tierion application stack. This provides the ability to trace both directions through the chain. If any recalls occur using this system, the source of the defects in the manufacturing process can be uncovered and the appropriate people be notified. If any questions arise around the validity of drugs or materials related to counterfeiting, manufacturers can prove their inputs and outputs were not involved with any nefarious activities. By leveraging the immutability of the Bitcoin blockchain and verifiability of cryptographic proofs, Veripharm allows the Pharmaceutical industry to save millions of dollars a year in tracing problems through the supply chain. 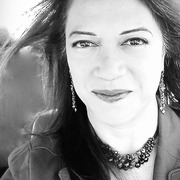 I was responsible for the UI/UX and designed and implemented the whole front end of the site. 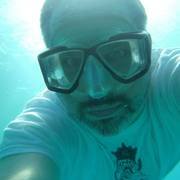 With a photography, videography, and graphic design background, the aesthetic and usability of a tool are paramount to what I do. 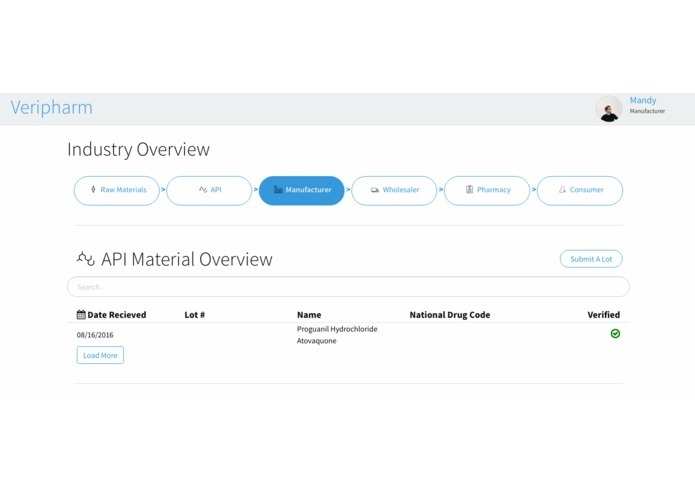 Initial concept; defined scope in context of FDA regulations aimed at securing drug supply chain. Awesome team! I designed the architectural strategy as well as provided mapping the solution to the regulatory requirements.